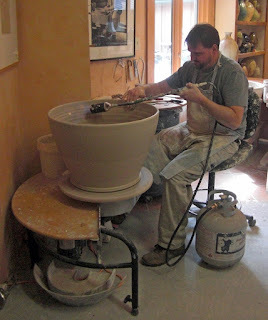 How do you make a really big pot? By doing several things at once. We watched Ben Own smooth the outer surface while he used a heat tool to dry and strengthen the inside. He worked the pedal that kept the pot turning and answered questions, all at the same time. This ability to multitask must be genetic. He is a third-generation potter and the third Ben Owen. Seagrove, NC is home to scores of ceramics artists. This weekend was Seagrove's annual Celebration of Spring, an opportunity to explore the back roads and visit artists working in every style imaginable. Try to come next year, and expect to go home with at least one pot, plate or bowl.